Most stinging insects won’t actually attack unless they’re provoked. If you get a sting while in your yard, chances are that you’ve got a population of stinging insects on your property. The important question to ask after you get a sting is: which type of insect stung you? This will help you make decisions about how to treat the sting, as well as how to avoid contact with the pest in the future. Oftentimes we don’t get a good look at an insect before it stings us, and many stinging pests can look similar at a glance. The good news is that there are other ways to identify an insect besides just looking at its body. Clues such as nest location, nest material, and flying patterns can give us an idea of which insect we’re dealing with. Remember: some individuals are allergic to certain insect stings. If you start to experience symptoms of anaphylaxis soon after getting a sting, contact emergency services immediately. Anaphylaxis symptoms include shortness of breath, wheezing, hives, lightheadedness, and a feeling of swelling in the throat or mouth. Honey bees, bumblebees, and several other types of bees are all related, but have different appearances and daily patterns. All bees belong to the apidae family. However, not all apidae are created equal. Why does this matter? Some bees will leave their stingers in our skin. This creates a problem for us, and kills the bee. Others types of bees will hold onto their stingers, maintaining the ability to sting over and over. Honey bees are luckily not aggressive, and the only time they’ll sting is when they’re threatened. Honey bees fly low to the ground, and when a playful child kicks or steps on one they may take this as a threat. When a honey bee stings, the barbed stinger is left in the skin of the victim. Don’t attempt to remove a stinger with tweezers, as that may inject more venom. A common method for honey bee stinger removal is using the edge of a credit card to scrape it out: simply scrape the credit card across your skin and the stinger should come out easily. Bumble bees don’t have barbed stingers like their relative the honey bee. 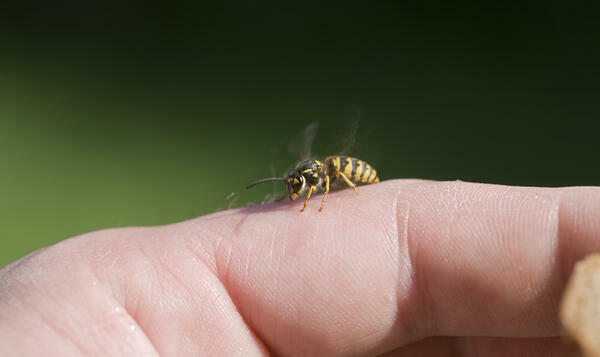 When they sting a human, they hold onto their stingers. This is both good and bad: while it’s great not to have to remove a stinger from our skin, the bumble bee is able to sting a person repeatedly with its stinger. Similarly to bumble bees, wasps hold onto their stinger after an attack. This means that one wasp has the ability to sting a person multiple times. Luckily for us, wasps are not aggressive, and they’ll only attack if their nest is disturbed. Wasp nests look like honeycombs, and they’re most often found under the eaves of a house or other outside structures. Wasps come in many different colors, but all of them dangle their back legs when they fly. Unlike bees and wasps, these stinging pests are aggressive. They have voracious appetites, and you’ll often find them scoping out the food at cookouts and local events. They're not afraid to fly right into a glass of juice to have a drink, so keep your eyes out! Yellowjackets are scavengers, too, which means they often come into contact with bacteria. As a result, yellowjacket stings can lead to skin infections. Keep in mind that yellowjackets build their nests in or on the ground, too, so it’s important to watch where you walk. If you or a loved one end up with a yellow jacket sting, it’s best to clean the area and apply a first aid cream. You don’t need to worry about removing the stinger, as yellow jackets don’t leave theirs behind. You do need to watch the sting, though, and contact a doctor if you begin to experience signs of infection or fever. Hornets are easily identifiable by their unique, papier-mâché style nests. They have either yellow or white faces. They won’t attack unless provoked, but it doesn’t take much to anger a hornet. The vibration from a lawnmower in their vicinity is enough to compel a hornet to sting. Hornets don’t lose their stingers, and an angry one is capable of stinging a person several times if seriously provoked. Hornets love fruit. Are you waiting on a pest control service to arrive and take care of your hornet problem? Try to avoid perfume in the meantime, as fruity and flowery smells attract hornets to your body. If you have fruit trees on your property, you can prevent hornet populations by removing any soft fruits from the ground. Decomposing and fermenting fruits are irresistible to hornets, and may compel them to take up residence in or near your fruit trees! No one wants stinging pests on their property or in their home. When provoked, a stinging insect can inflict serious pain. And, in the worst case case scenario, an allergic individual may suffer from anaphylaxis, which requires a trip to the emergency room. Removing stinging pests from your home or property is a job for professionals. Working with a licensed pest control company is the safest and most effective way to remove the threat of stinging insects from your yard. A certified stinging insect specialist who uses environmentally friendly methods has the expertise to get rid of stinging pests without harming untargeted insect species. With the help of the knowledgeable pest professionals at Home Pest Control, you’ll eliminate your pest problem quickly and affordably.